WIP Wednesday: Hmmm . . . .
Added another project to July’s list yesterday! My partner has been contemplating what he wants his next custom cycling jersey to look like. It probably didn’t help that I found an online source of wicking athletic poly knit in many lovely bright colors, complicating the decision for him. But he finally made up his mind yesterday–a Mondrian-inspired jersey! THE famous Mondrian-style jersey is this one, which I was hoping against hope he wouldn’t want because it is a) hideous, and b) nightmarishly complex. I was quite relieved when he presented me with the drawing above, which is much simpler. Yep, this is something I can do. He would like it for LEL, if possible, but that may not happen, considering that the company with the knit he wants is closed for vacation until July 10th. What I’m going to try to do is get everything else done and reserve that last week before we leave just for the jersey. I should be able to do it, but I’m determined to not make myself (more) nuts over it. As far as the “everything else,” where do we stand? The sew-along dress is almost finished, but well, hmmm. Sorry, too tired to get the tripod out this evening. Strictly speaking, the only thing left to do is sew the shoulder seams. This is gonna need a bit more work than that, though. Notice anything strange in the picture? Those armholes are low, as in SUPER LOW, as in “oh, nice bra you have there!” low. Same problem here in the back. I’m thinking I might slipstitch the armholes to reshape them and close them up more. The keyhole back is a bigger problem. I could unpick about the lower half of the egg (and did I mention HOW VERY GLAD I AM that I didn’t give in to the urge to topstitch all this?) and reshape it with more slipstitching. I don’t think that would give me enough additional fabric to cover the bra, though. Another idea: put a flange-y sort of thing out of the flowered fabric around the inside of the hole to close it up a bit. Or maybe both ideas–reshape the hole, then add some flowered faux piping? I’d prefer not to cover up the egg completely, but I’d love to hear any ideas you might have. Despite the overexposure problem, though, there’s a lot that I love about this dress. The muslin didn’t impress me one bit, but I sized up for the “real” version and also added 2″ to the length of the bodice. You can’t really tell here, but the bottom edge of the muslin is about level with the bottom of my bra. Interesting how going up a size made such a huge difference in the armholes . . . . I also lengthened the dress to mid-calf length and added POCKETS! And these fabrics are so nice–so soft and comfy! I actually sized DOWN on the skirt because I was concerned that the gathers might be too much in the interlock (pattern calls for jersey). Gathers turned out great. So the plan is to sleep on the problem, then tackle that bodice again tomorrow. Have an excellent Thursday, and I hope all your patterns come with pockets (I can’t believe they don’t already, but obviously nobody in charge of anything ever listens to me). Hot afternoon still life with binding. Sunday Sevens hasn’t been happening too often around here lately, as I just haven’t had many opportunities to take interesting photos. I’ve got a few fun things to share with you today, though, so let’s get to it! SCRAP recently had a jewelry repair workshop and Rachael and I fixed about a bajillion broken bracelets. I had been stuffing broken jewelry in a box for YEARS, and I’m so happy to have it all back! This was a big mood booster for me, as I LOVE my jewelry and the arthritis in my hands is to the point now where I pretty much can’t wear rings any more. I’ve been working away a bit at a time on my fabric database in Evernote. I’m up to 64 pieces of yardage, which I think is maybe 2/3 of the total. I’ve pulled out the ones I don’t love and they’ll be going to SCRAP. This feels like the bigger accomplishment, though. I went through all my scraps and filled these three big bags with all the ones I don’t like and won’t use. These bags were posted in my local Buy Nothing Facebook group and wound up going to a little girl who’s taking a sewing class and wants to make doll clothes. I thought it would be hard to give all this up, but I realized as I went through everything that these fabrics felt more like a burden than anything else–I didn’t want to use them, couldn’t see a way to use them, but I felt a lot of responsibility to not waste them. When they were picked up, and that burden lifted, I felt light, and so moved that I was able to help out a beginning sewer. And all my scrap drawers close again! This past weekend, my partner and I headed down to Eugene, OR, so that he could ride a 300k brevet organized by one of his buddies. While he was out there riding (in temps over 100F! ), I explored Eugene, which I hadn’t seen since I was a kid living in Medford, OR. Lots of cool older houses and mature trees! Love this Craftsman bungalow, now divided into offices. Every time I go to Oregon, I’m reminded how big and new everything is in the Tri-Cities, where I live–pretty much everything here was built after World War 2. This looks more like a courthouse, but it’s actually a Protestant church–that’s stained glass in those second floor windows. I like the blue banner celebrating Ramadan; on the left side is a Pride flag. This is the kind of thing that cheers me up when the political news is ugly. Saturday afternoon and evening were spent in the air conditioning at the motel, watching some good TV (PBS) and also some bad TV (horror movie starring some menacing frogs and a very young Sam Elliot) while I worked on my quilt binding. As always, many thanks to Natalie over at Threads and Bobbins for starting Sunday Sevens and encouraging us to document and celebrate our adventures. I hope you all have a very excellent week and have a little sunshine wherever you are (temps below 100F would also be nice). I was thinking in the shower yesterday–where I do all my best thinking–that I should take along some sort of hand sewing on Friday when we head down to Oregon again for another bike ride. I am happily cable-free at home, but I do love sitting in a hotel room in the evening and stitching away on something while listening to a terrible movie. But the only hand sewing involved in my current list of projects would be the binding on my baby quilt–surely I couldn’t get that quilt to the binding state by Friday, could I? Because I love a challenge (and I am not quite right in the head), I decided to try it. I got all the applique sewing done last night; I wasn’t sure I’d ever un-kink my neck again after I finished, but I did it. Today I figured out my borders and put them on. I’ll put together my quilt sandwich tonight, then I’ll have Thursday and Friday to quilt and bind. Maybe I had better start planning that quilting tonight . . . . I also finished up the second Simplicity 1199 over the weekend, and I’m really liking how this one turned out. I wore it while out and about on Tuesday, and it was super-comfortable and cool in the hot weather. The hem needs to be pressed, but it’s not bad for being fresh out of the dryer. The neckline lies a little better on this, I think because I tried a different method on it. (Completely forgot I was going to try a chest adjustment on this top until after I’d cut it out.) The instructions have you apply the neck band like a quilt binding: fold in half wrong sides together, sew raw edges to neck edge, fold band to inside and machine stitch down. On this one, I sewed the raw edges of the band to the neck, then pressed the band up and the seam allowance down toward the shirt; I then sewed the seam allowance to the shirt, giving it a nice finish, I think. I’m too lazy to look it up, but I think this neck band technique came from the Love Notions Laundry Day Tee pattern (free when you join the Facebook group), which I printed out lately as a possible use for some SUPER SEXXXXY turquoise rayon jersey I picked up at SCRAP (seriously, with that gorgeous drape, those glowing colors, that subtle sheen, rayon jersey is HAWT). I spent a fair bit of time working on finishing this top nicely, as I really want to improve my knit sewing skills. The white fabric with the dots (it looks like one of those über-’70s bead curtain things to me) is a cotton jersey and the edges curled, so I worked diligently to keep the fabric flat when doing the neckline and hems. I would have loved to use the blue for the neck band, but it has a somewhat rough texture on the right side, and I knew it would drive me bananas to have that on my neck. So, sure, it’s a pretty basic tee, but I’m proud of the finish on this, it feels lovely to wear, and I may figure out this knit business yet. Also in Tuesday adventures, I went over to Fred Meyer to look for pants (it’s a Pacific Northwest chain of grocery stores that also carry clothing and other things; I have a terrible time finding pants that fit me, but I’ve had good luck at Fred’s, for some reason). And, yes, someday I’m going to learn how to sew pants that work for me, but today is not that day. I found these pants that are totally secret pajamas–look like regular dress pants but don’t have a zip and the fabric they’re made with is actually the stretchiest stretch woven that ever stretched. Score! I bought two pairs. 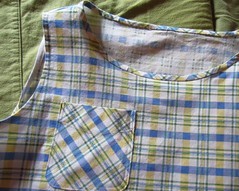 Problem is, those nicely-stitched (if blurry) pockets in the photo are fake! I googled and apparently this is now a thing. I haven’t bought pants in YEARS and sometime between the last time and now, lots of pockets in RTW clothing became fake–not just sewn shut but no pocket bag at all. So, this week I got one item off my to-do list and also managed to add one more–fixing the pockets and hemming (of course) my two new pairs of pants. Have a great Thursday and I hope the pluses and minuses are going your way. Making lots of progress here! Which is kind of amazing, considering how lousy I’ve been feeling, but I’ll take it. Baby quilt for my niece. All appliqué pieces are cut and fused on! There might have been a little bit of grumbling and swearing as I made my way along the Steam-A-Seam learning curve, but I got there in the end, and I really love how this looks so far (much better than I was able to capture in my picture). So many fun fabrics in this! Another version of S1199, short-sleeved this time. Just need to sew side seams and hem. She doesn’t look too thrilled about it, but this is right up my alley. I’ve got some black ponte for this, and assembled the rest of the supplies yesterday, so it is ready to start. B5456 dress for the Facebook sew-along–muslin of the bodice is done, sew-along posts and schedule are mapped out, and preliminary posts are up. 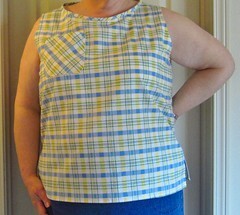 Navy blouse (McCall’s 7571)–still cut out and patiently waiting for me to get to it. Have a great Thursday and I hope you’re working on something that makes you smile. I have linked this post to Scraptastic Tuesday and Whoop Whoop Friday. Look–I almost have a waist! Today’s title comes from a favorite saying of a former co-worker of mine when I worked for the VP of a meat-packing company. My desk was in a room full of beef sales people–an excellent location for picking up colorful phrases, as well as beef recipes. Anyway, this past week I had one of those “OMG, I have HOW much time to do all that stuff?! ?” moments when I realized how much I wanted to get sewn before our trip to London and how few weeks there are before the end of July. So, I was in a bit of a panic, trying to figure out how I was going to get everything done, and then I got a gentle reminder about the sew-along I’m supposed to run next month. So, time to prioritize, spend my time wisely, and try not to freak out (or at least keep it to a manageable level). Today’s post will be me tidying up old business and planning next steps. First, the Hello Kitty top. I bought this pattern recently for no other reason than that I have a lot of knit remnants to use up and my knit tops (which I wear a lot, especially when I travel) are looking a bit old and scruffy. I didn’t think the pattern was very interesting, but worth a try. I love how this top turned out, though. I love how it has a little shape and gives me the illusion of having a waist (I tell you, I mourn the loss of my waist). I love the 3/4 sleeves. I love the neckline, which isn’t too wide or too low, as usually happens with my narrow shoulders and lack of boobage. I love how comfy the top is and that I have a matching skirt so that I can look totally put together and elegant in my cartoon cat head shirt. The binding on the neck is a little wonky, and I’m starting to think maybe I need a hollow chest adjustment. I’m wearing my plaid tank today, and it has the same problem. And the hollow chest thing seems to be a common issue among female sewers “of a certain age” (I love how that expression indicates old age without spelling it out, as if it’s a shameful secret). 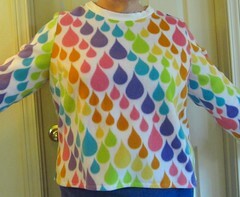 I’m planning to make another version of this top with short sleeves, but that may need to be put off until August. My other recent finish is the wall quilt, which I had set aside but finally finished yesterday. The only way I could find to take a pic of the whole thing–binder clips and a bookcase. You can just barely see it, but there’s a stalk of wheat below the text. I wanted it to be subtle, and I guess I got that. To be honest, I had hoped I would love it by this point, but I don’t. Which is fine, considering it’s not for me. I hope the recipients do, though. I love these fabrics! The yellow is from SCRAP, the flowered from the Goodwill in Newberg, OR, and I think they’re both cotton interlock. I’ve got several questions about that bodice, so I’m going to make a muslin of it this evening. I plan to do my dress in a midi length, possibly extend the sleeves a little, and add pockets (because pockets). I love empire waists and I think this could be a good look for me. If you’d like to join along, the Facebook group is called Sew-Along Dinner Date Dresses and it’s a very fun and helpful group. They’re making some really gorgeous (and challenging) Vogue dresses, so they’re acquiring some pretty great skills. I only wish more of those great patterns were suitable for the waist-free (Vogue 1424–so very cool, so wrong for my shape, sigh). Have a great Thursday and I hope you’re keeping all your proverbial balls in the air.